When traveling to Tulum – you will fly into either Cancun or Cozumel. We chose to fly into Cancun because the flights were cheaper. To get to Tulum, we used SuperShuttle – a shuttle company that’s at the airport as soon as you leave the gate. We were able to easily schedule ourselves a shuttle to Tulum as well as schedule a shuttle to come pick us up from our hotel on our last day, and take us back to the airport. I highly recommend them – you can’t miss their signage. It’s bright blue and yellow and there are tons of workers standing outside waiting to help you book a shuttle to your destination! On the day that they came to pick us up from our hotel and take us back to our taxi, they came at the exact minute that they said that they would. Super reliable and helpful. Take out USD at the airport before leaving for Tulum. You’ll be able to exchange your money for Pesos. Depending how long you’ll be staying, you’ll want to take out cash and pay for food / excursions and anything else in Pesos. While most places accept debit, you’ll end up getting charged extremely high taxes / fees! BE WARE of the gas stations – I’m so serious here! Particularly the PeMex located right outside of Tulum. If you rent a car and need to fill up gas, pay in CASH. Billy got scammed by the gas attendants there and we ended up getting charged THREE times what it was. So, instead of paying $800 MX we ended up paying $2400 MX for gas. Basically, the gas attendant took Billy’s card, came back and showed us a slip that said “declined”. He said that they didn’t have service and it wasn’t his card but they couldn’t connect to the internet in order to run the card. So, we ended up paying him $800 MX for the gas. When we got the airport, Billy looked at his bank statement and it showed that the gas station charged him $1600 MX for the gas. SO, they said that his card was declined when in reality they doubled the charge and made us pay in Pesos. After Googling this, there are hundreds of other testimonies of the same thing happening to travelers in Tulum. The first part of our trip was stayed at MangleX Tulum – a jungle cabana oasis complete with it’s own cenote (fresh water preserve) and pool! It’s steps away from the beach and you have full access to the beach club across the street called Rosa Del Viento Hotel this is where we rented bikes and found a few excursions to sign up for. We absolutely loved MangleX but it’s a place you should only stay for a few nights. You are truly getting the jungle experience in this location – the sounds of nature are breathtaking and the cabanas are beautiful. Think wooden beds, long flowing canopies and wooden showers – it was beautiful. However, there’s no air conditioning – luckily we came in December when the temperatures were a little bit more bearable but I couldn’t imagine staying here in the heat of the summer. This is where we stayed the second half of the trip! Caleta Tankah is not on the main beach front strip – it’s about a 10 minute taxi ride to the main strip of beach. BUT, there are private villas (we had an ocean front view). I wouldn’t say that the hotel room was exactly “nice”, but for booking last minute it was pretty freakin’ amazing (and affordable!). Caleta Tankah has it’s own private cenote that was so beautiful, picture of it below! And your private villa on the beach was so quiet and peaceful! We had no idea how crazy the food was going to be in Tulum. Let me just tell you it’s to die for. Pro Tip: Book your reservations in advance. 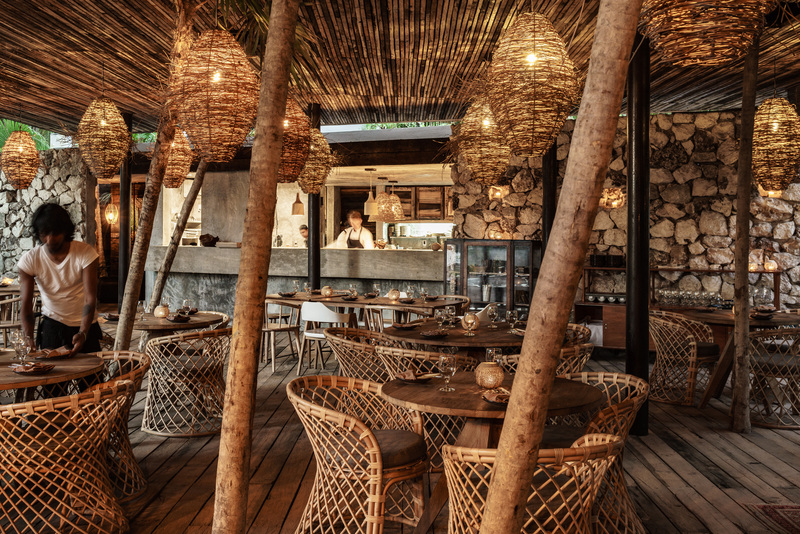 Scour the internet for the best restaurants in Tulum and make reservations in advance. Since this was a last minute trip, we had no reservations anywhere. LUCKILY we were patient, kind + each restaurant found us a reservation! These photos are NOT my own – I’ve taken them from Ocumare’s website. BUT since we ate here late at night, I wasn’t able to capture bright photography of what the entire restaurant looked like and just HAD to show you. This was the first restaurant that we went to on our first night. The drinks (more-so the bartenders) were insane – probably the best margarita that I had all trip and we have plenty of margs! Ocumare was created by Michelin Star chef Mauricio Giovanini – they’re known for their small dishes (as seen above). 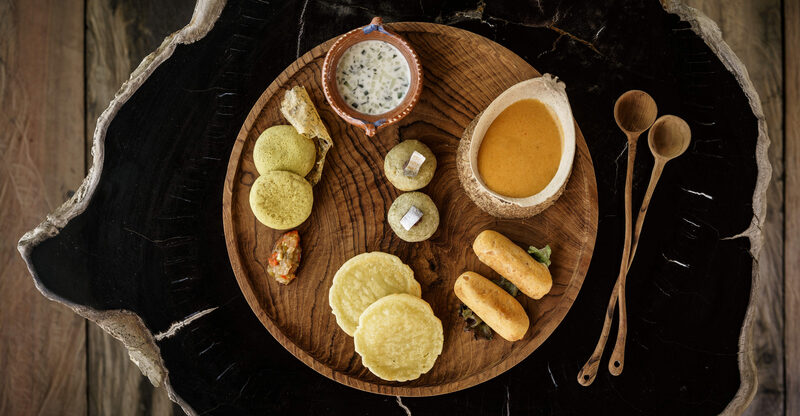 Each course (it’s recommended that you do a four course meal) has smaller-portioned dishes which is a common theme in Tulum at the more up-scale restaurants. It goes to show how a little dish can make a mighty impact (and at how grossly large American sized portions are). ANYWAYS, this was probably my second favorite restaurant. The food was to die for and the service (as all places in Tulum) was exceptional! This is the perfect spot for a “splurge” meal when you wanna treat yourself to some amazing food and a great atmosphere. There was a live band while we were eating! Again, these photos aren’t my own but I want to show you the beauty and architecture that goes into all of the restaurants and boutiques in Tulum. There’s truly no better way to describe this restaurant – it’s an open air concept. Like most places in Tulum, there are no walls just canopies built with natural elements from the jungle. It actually started drizzling when we were eating there and the servers RAN to every table with an umbrella. It’s just amazing how prepared they were and such a cool experience to be eating dinner in essentially a rainforest when a little shower passed through. 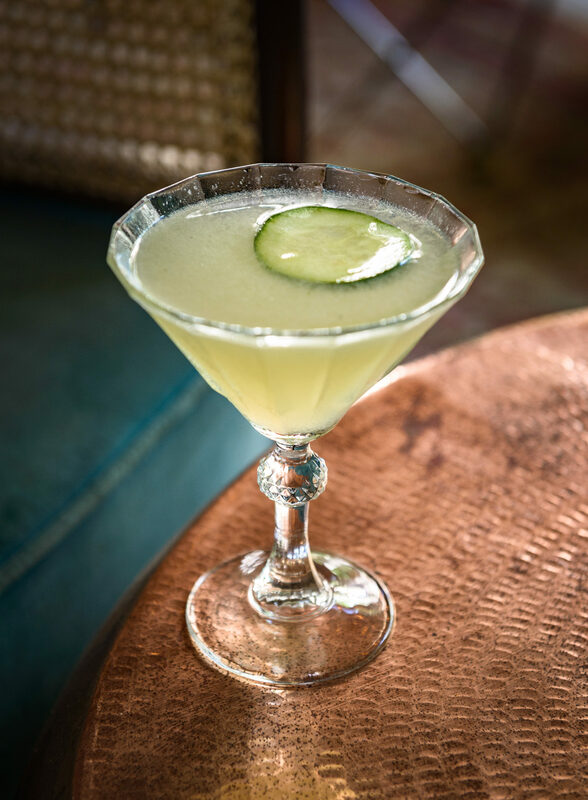 WILD is an extremely cool concept – the menu is truly inspired by the Yucatan people while also having that Caribbean flavor that we all love. If I had to pick between WILD and Ocumare, I’d choose WILD for a beautiful dinner. 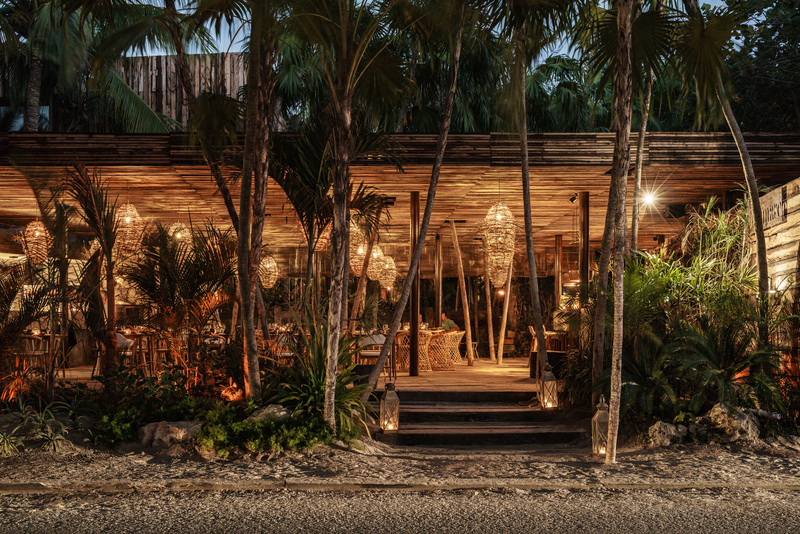 If there is one place that you HAVE to visit while you’re in Tulum, it’s Azulik. It’s the most architecturally beautiful and inventive place that I’ve ever been. There are no words to describe it so I will just share photos! Making reservations here is a MUST – the further in advance that you can make them, the better. We luckily made friends with the manager of the Spa in Azulik after getting massages that he finessed reservations at both Kin Toh and Cenote in Azulik. We got light appetizers at Cenote inside of Azulik while we waited for our main dishes. I absolutely LOVED the beef dish – it was basically beef jerkey but not dry frozen? LOL! Does that make sense? Anyways, we ate in the most beautiful space ever – it’s called the “nest” as you can see from the pictures. It was the largest table that I’ve ever seen in my life completely immersed in the jungle. Apologies for the photo of the random stranger, LOL! BUT, how cute is this place?! It’s a little matcha / smoothie place with the FRESHEST drinks and acai bowls ever. I died over the design of the place – there were swings that you sat on while ate. Our favorites were the Gin Gin shots – raw ginger shots perfect for kicking your immune system into gear when traveling abroad. The chia seed pudding was also to die for! This was our last meal in Tulum – they had the most insane salsas that you ate with freshly baked tortilla. This place is perfect for tacos and a great atmosphere. There is so much to do in Tulum – but I think that 5-6 days or a long weekend is the perfect amount of time. While Tulum is hands down one of the most beautiful places that I’ve ever seen, it’s also small! So, I’m going to round up some of my favorite activities and excursions that we went on while visiting Mexico. Here you’ll be able to explore Mayan Ruins if you don’t feel like venturing out to the other sites (which we ended up doing because they were so beautiful). Now this was amazing – the Mayan ruins in Coba are the only ones that you’re still permitted to climb up. Billy and I rented bikes once (only like $3 USD each) inside of the national park which helped us get to all of the different ruins. Once we got to the main pyramid, we climbed all of the way up to the top! SUCH A COOL EXPERIENCE. Just remember to wear sneakers and not sandals like us, LOL! I highly recommend climbing to the top, even if you’re scared of heights because the view is well worth it. You get an aerial view over the entire Mexican jungle – it’s absolutely breathtaking! There is a rope that is basically a railing that you can hold on to the entire way up and down to get better balance while climbing. This is the most famous Mayan Ruin and also a 7th Wonder of the New World. It took about two hours from Chichen Itza from our hotel, BUT the Coba ruins are on the way. So, if you make a day out of it I believe that it’s well worth it. We used a rental car to get to-and-from the ruins but there are plenty of tour buses and groups that you can go with. Forewarning, there are a lot of people at Chichen Itza – if you’re like me and get anxiety in large crowds it may be something to think about. Luckily, I had Billy there with me to lead the way so that I didn’t have to walk around the big crowds. I also think that it was so crowded in the main entrance because it was pouring rain so everyone was huddled underneath the covered awning. Once we actually got to the main pyramid, I was completely fine because everyone was spaced out. This was probably my favorite day. It was absolutely breathtaking. I’ve never seen more clear / turquoise water in my entire life. We used Cancun Bay tours to take us to the city of Punta Allen (we absolutely loved our tour guide, Herlan). He was so knowledgeable about Punta Allen as well as the area – he knew every animal and the best spots to go and find dolphins / sea turtles. Anyways, Punta Allen is about two hours by shuttle from Tulum. A shuttle picked us up from our hotel and took us all of the way to Punta Allen down the rockiest and bumpiest road ever. There is absolutely nothing for miles and miles other than ocean and jungle. You travel down the road for about an hour and a half until you reach the small, nearly deserted town of Punta Allen. There couldn’t have been more a population larger than 50 people. The people in Punta Allen live only with electricity from 10AM until 6PM – at night time, it’s extremely dark there. But they wouldn’t have it any other way. These people truly embrace community and leaning on one another. It seemed like the entire town, no larger than two blocks knew each other. Every one got along and supported one another. Anyways, we hopped onto a boat by a local fisherman. These fisherman go out every morning to catch food for the town every day – they know exactly where the dolpins and sea turtles are. Our tour guide told us that the dolphins can sense energy – they know when you are excited and happy. He told us to cheer and make noise to attract the dolphins and out they came! There was a family of five and even a little baby turtle. It was truly the cutest thing that I’ve ever seen. Afterwards, we went to go find the Sea Turtles – these creatures are much more scared of humans than dolphins. The turtle popped his head up once or twice and immediately dove back down for another 10-15 minutes. If I were to recommend one thing to you all, it would be to take the shuttle to Punta Allen and go dolphin / sea turtle watching. It was an amazing experience. I truly don’t even know how to describe Azulik to you guys – the pictures speak for themselves! Azulik is thee spot in Tulum (they ahve over 646K followers on Instagram) – it’s probably the most notable and sought after hotel in the town! We thought that we could just walk in to explore but boy were we wrong. We had to either have reservations at the restaurant or purchase a day pass (which they weren’t selling that day because the hotel was fully booked). BUT, we found a loop hole. I knew that they had a spa there – they focus on wellness and you can do everything from massages to Chakra ceremonies and everything in between. I asked if we could go to the spa and get a massage. She brought us into the lobby and had the spa manager come get us. Boy did we not even know what we were getting ourselves into. Azulik is the most magical place that I’ve ever been in my entire life. The place, from top to bottom is breathtaking. The only way that I can describe it is an indoor tree house. So, we ended up getting beach-front massages (deep tissue might I add) and they were the best massages we’ve ever had. Afterwards, we made such good friends with the Spa Manager that he found us reservations at Kin Toh and got us a table at Cenote for appetizers. While waiting for dinner, we explored the gallery and all around Azulik. You can seriously get lost in there. It’s amazing. If there’s one place that you absolutely, positively have to visit while in Tulum, it’s Azulik… Pictures do not do it justice! You are in the Mexican Carribean after all – the beaches are gorgeous and the temperature in December was just perfect! The shopping in Tulum is absolutely insane. I’ve never seen cuter / trendier boutiques in my life. All of the boutiques are built in little huts, each filled with the most unique and beautiful pieces. BUYER BEWARE – the boutiques, for the most part, are extremely overpriced. I found the most beautiful dress of my dreams and it cost $12,000 MX which equates just over $600 USD. Now, that’s probably the most expensive that I saw, most items like hats, bathing suits and dresses were around $100–$200 USD which is expensive. So, it’s safe to say that I left Tulum empty handed. HOWEVER, I did purchase two straw bags from local Mexican merchants who owned family operated businesses. These businesses are fairly priced and carry the most beautiful hand made goods!